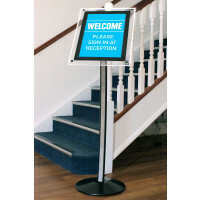 Scribo Displays provides menustands that comprise poles coated with satin black powder and bases coated with poster powder of the same colour. The menustands have a stylish perimeter 'halo' effect and their 'edge-lit' LED illumination ensures that they have 24/7 visibility. The LED can be installed without help from a qualified electrician and the menustand can be maintained easily as there is no breakage of bulbs. 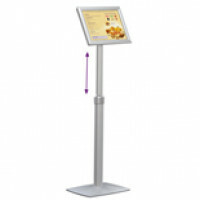 These menustands operate on low voltages, consume less power and are completely. To top it all, their expected shelf -life is more than 50000 life hours. Spare some time for a glimpse of our long lasting menustands and you might find just the right menustands for many of your upcoming trade shows.